In the first picture you can see the cold front that has moved past Sydney before the start. The wind is still shifting, good because it allows sailing away from the coast for an easy DC start. 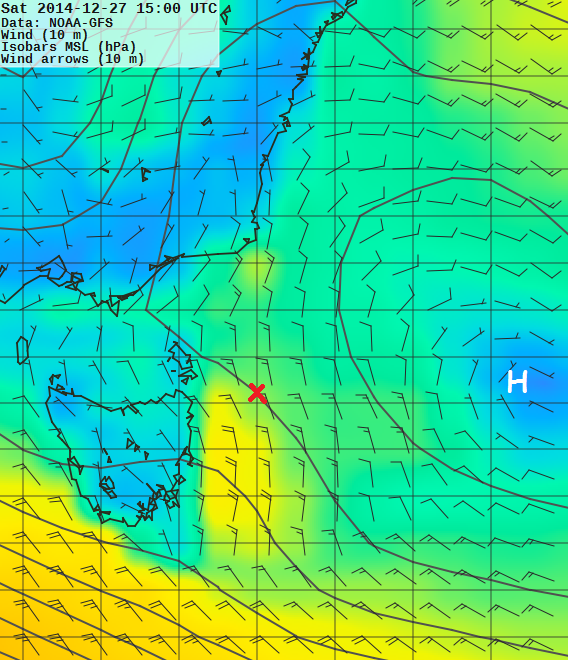 The wind flows from Bass Strait along the coast, I will have to tack somewhere inside the rotation. 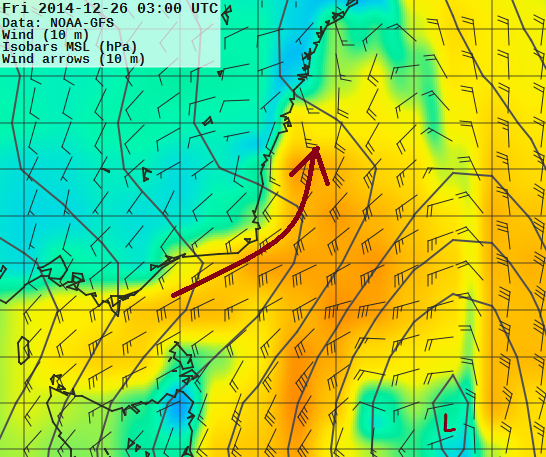 After 24h of beating upwind, the wind has dropped off. You can see a high forming north of my position. A big low sits somewhere in the south. By moving south I get better TWS and TWD. The rich get richer. This is 36h into the race. The high is building up, we get strong wind between the high and low. 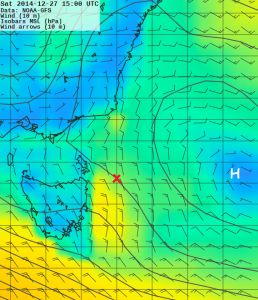 Tasmania gives some wind shadow, this could get complicated. But for the time being, rich get richer. Bottom line is I must move south fast. 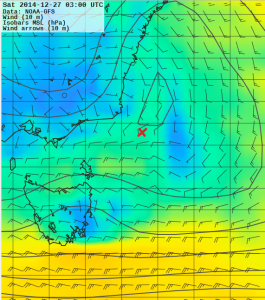 My target will shift a bit from east to west, I want to get off the coast early for better pressure, and close in on Tasman Island late… I also make no apologies that this is a software driven race. I could draw a reasonable route by hand, but that’s not going to win in this ‘start first, increase your lead’ situation. Not much tactics really, I did pay attention on the tack, but no surprises. My biggest problem right now is the ETA for Tasman Island, 4:50 am outlaw time. No idea how that will work out. 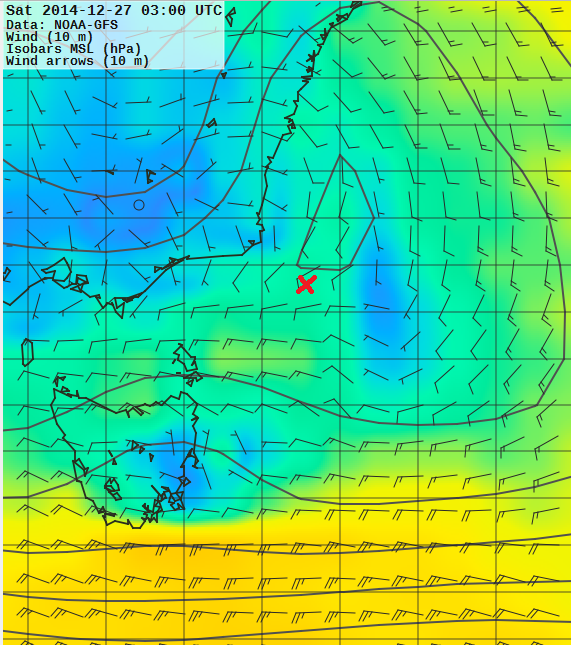 Last few hours to Tasman Island: up to 230??? Of course at Tasman Island rule #1 strikes again. 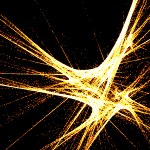 I wake up with 10 minutes to the WP, to see my DC gybe would send me straight on the rocks. Disaster averted. Bringing it home I go for minimal effort to avoid mistakes, TWA across Storm Bay, then COG to the line. Overall a flawless race, I don’t think my competition made mistakes either. I may have had a 30s lead on Dingo & friends going into Bass Strait, that balooned only due to the nature of this race. Well done guys, and congrats NOR_Lolla for winning part 2 and the double series! 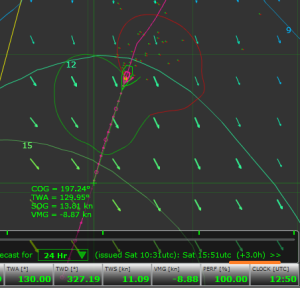 I like your prerace analisys, as normally one sails the plan, so planning the sail is fundamental. Nice reading. Thanks for sharing.